Outdoor spaces add openness, beauty and curb appeal to your home. In fact, well-designed gardens and yards add to the value of your property as well. 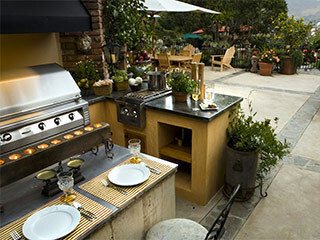 When it comes to adding functionality to a yard, most people prefer to add patio kitchens. These features become the perfect relaxation spot. You can also use this area to entertain friends. Over the years, we at Scapes and Stones have also handled a large number of exterior kitchen design and installation projects for customers throughout greater Las Vegas, NV and surrounds. When you hire our services, you are assured of the best solutions at the most reasonable outdoor kitchen cost. 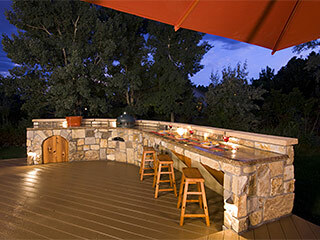 We know that our clients are very particular about the manner in which they get these outdoor kitchen areas designed. Most of them have a very clear idea about the type of ambience they want to create on their property. In that case, we work very closely with them to understand what their vision for that space is, and then provide solutions that work perfectly for them. At times, our customers have just a very general idea about what they want their kitchen to look like. In this instance, our designers take extra efforts to focus on their likings and they then provide the right type of solutions. We also use 3D design software in our work; this helps us give our customers a clear idea about how these areas will look like once they are installed. Once they approve the design, we then ensure that the work is completed to their 100% satisfaction and within the agreed-upon time frame. Some customers like very elaborate deck kitchens; they want all the latest kitchen appliances, BBQs and grills, refrigerators, preparation and cooking counters as well as a bar space. At times, they also want a fire pit or fireplace installed and we handle that job too. Contrastingly, some of our customers prefer more simplistic kitchen designs, with just a single counter and a basic cookout area. Regardless of what your specific requirement is, we can provide you the kind of solutions you need. We ensure that all the materials used in these installations are weather-resistant as they are constantly exposed to the elements. We use high grade materials like natural stone, brick and concrete pavers, the best lighting fixtures and outdoor kitchen fireplace design concepts. We also create retaining walls with in-built outdoor seating. This helps avoid overcrowding in the kitchen space as you can then place less patio furniture there. It is this attention to detail and the fact that we always provide custom outdoor kitchen concepts and personalized services that has made us the preferred landscape professionals in the area. Speak with the Scapes and Stones experts at this number 702-278-3228 and give us some more details about your project. You can also contact us through our online form and we will respond shortly.